People use fake nails for two different reasons. Some use them to be a little “extra” in parties. For others, they use them to hide imperfections in their nails. But whatever your reason is, we know that quality and performance are your top priorities when buying them. So, we present to you our list of the best fake nails to buy. Want to make a statement wherever you go? The ECBASKET Coffin Nails are your best bet. These fake nails are a must for any style icon and are designed to perfectly fit your natural nails. Great even for DIY nail arts, we love these nails because they’re great in holding color. This means that you’ll be rocking any type of polish as it won’t streak or separate. They’re made of light, breathable, and durable materials so you don’t have to put pressure on your nails. These qualities also make them easy to trim or file down to your desired length. Plus, these nails are non-toxic and are environmentally-friendly. Each bag comes with 10 pre-numbered nails so no need to worry which one goes in which nail. These fake nails are long lasting, too, and can last for up to 3 weeks with proper care. These fake nails look so perfect we get compliments every time we wear them. We only suggest using nail glue with these nails because they don’t seem to work with acrylic. 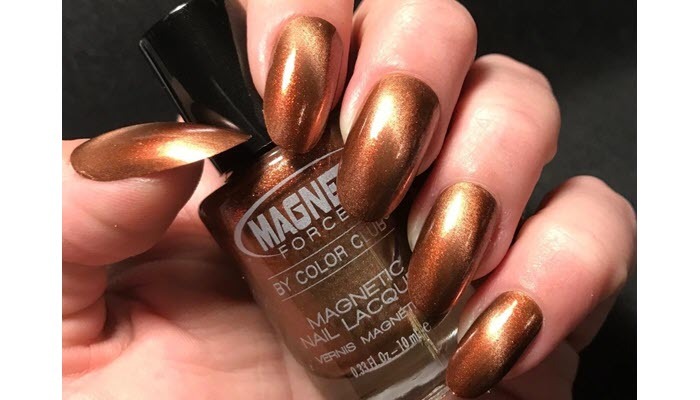 If you love the look of mirror nails, the Ejiubas Full Coverage Chrome Stiletto Nail is what you’re missing. Each nail comes with a chrome design so they’re perfect even if you don’t have talent in nail art. Although you can still paint them if you don’t like the color or to switch things up. Made of high-quality materials, these can easily be filed and cut to whatever shape you want. 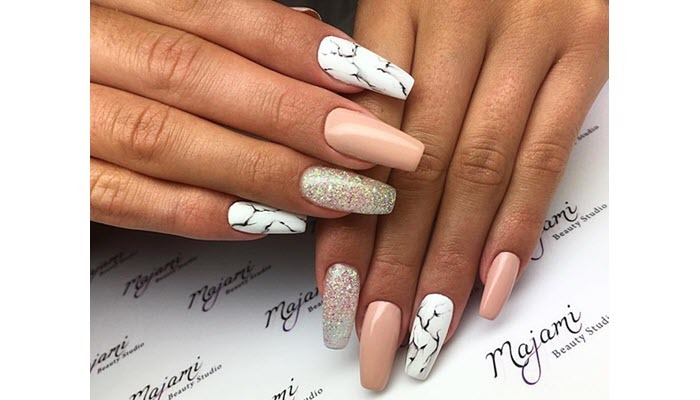 This is to get the most natural-looking nails or at least look like they’re done by a professional. Each fake nail is slightly see-through and looks very nice when hit by sunlight. It also comes pre-numbered so it’s easy to know which one is made for each nail. The best part is this set already comes with its own glue. The glue is really strong and is perfect! But, it dries up too quickly so we suggest getting an extra bottle when buying this kit. They’re also long-lasting. These nails can last for up to 2 weeks but they can last even longer with good quality glue. The BTArtbox Press-On Full Coverage Short Oval Nails is the perfect balance between wearing fake nails and still looking natural. This is actually our favorite item in this list. We think they have the right length you barely have to trim them down. Nail polish also applies smoothly on each nail but even without nail polish, they still look great. We only suggest using a glass file and not a board or metal file. Other brands require you to layer several coats of glue on each nail to make them harder. But with this product, we found that only two coatings are enough to get the job done. These fake nails can last for up to 2 weeks with proper care. Using glue will help make the nails last longer but you can also use nail art adhesive tape if you prefer. 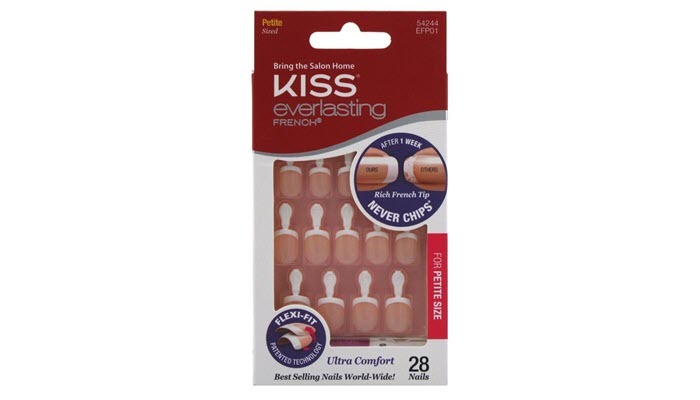 People with small hands will love the Kiss Products Everlasting French Petite Nail Kit. This kit is also great if you want to try out fake nails but aren’t sure if they’re worth the investment or not. What we like about these fake nails is they come in self-tabs so they’re easy to apply. The white tips are also patented so they won’t chip or crack easily and can last for up to 2 weeks. If you have a damaged nail bed, we know how hard it is to get a good manicure. But, these nails just look so real a defective nail bed isn’t a problem anymore! The kit comes with pink glue, too, so your manicure will look natural. You don’t have to worry about the glue showing through—they’ll turn out fine as long as you don’t apply too much. However, we suggest having extra pink or transparent glue since the one that comes with it dries out quickly. Our tip is to apply glue both on the fake and natural nails to make them last. They’re also perfect for active people because we found that dirt and gunk don’t easily get lodged under these nails. Most fake nails are made of acrylonitrile butadiene styrene (ABS). It is a type of flexible yet durable plastic that resists yellowing and has a smooth surface. Full-well tips – they have the largest contact and have the most grip. 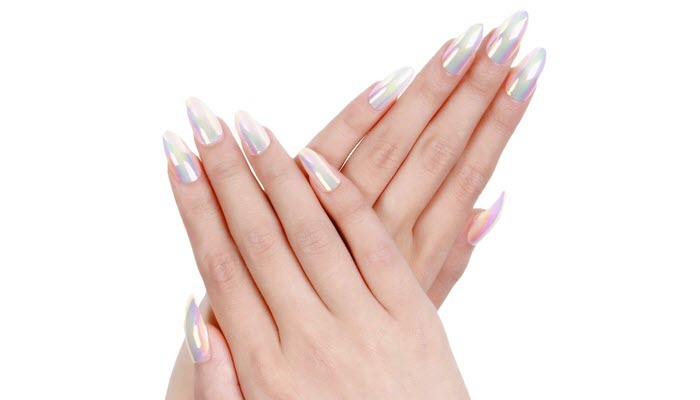 They’re perfect for hiding bitten nails but they also require the most blending. Half-well tips – they have lesser coverage but are easier to blend and apply. 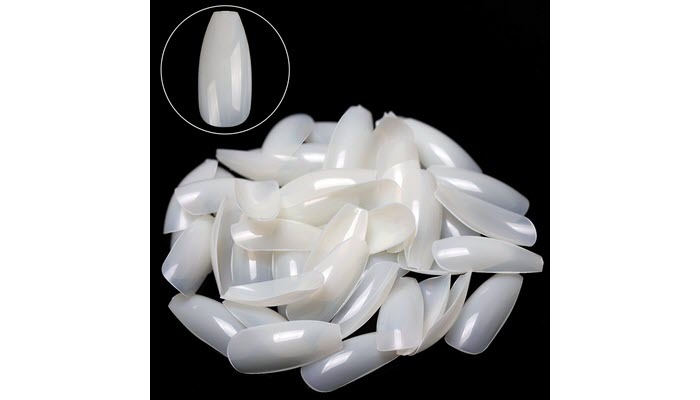 Well-less tips – they can be applied anywhere on the nail plate and are the most versatile. They also don’t need blending and are great for white or French nails with a precise smile line. Note: blending is done to “erase” lines for a smooth transition from the natural to the fake nails. Choose a nail with a C-curve that is almost similar to your natural C-curve. Also, the width of the tip must fit well on both sides for good structure and strength. With proper care, fake nails typically last for 3 weeks. But if you have natural nails that tend to curl, we suggest using cuticle oil regularly to keep them hydrated and more pliable. The ECBASKET Full Coverage Coffin Nails are our pick as the best fake nails to buy since they’re durable and lightweight. Each bag also comes with a lot of nails that you can use for a long time.